A topographic map with contour intervals. Topography (Greek topos, "place," and graphia, "writing") is the study of Earth's surface features or those of planets, moons, and asteroids. In the broadest sense, topography is concerned with local detail in general, including not only relief but also vegetative and human-made features, and even local history and culture. This meaning is less common in America, where topographic maps with elevation contours have made "topography" synonymous with relief. The older sense of topography as the study of place still has currency in Europe. For the purposes of this article, topography specifically involves the recording of relief or terrain, the three-dimensional quality of the surface, and the identification of specific landforms. In modern usage, this involves generation of elevation data in electronic form. It is often considered to include the graphic representation of the landform on a map by a variety of techniques, including contour lines, Hypsometric tints, and relief shading. The term “topography” originated in Ancient Greece and continued in Ancient Rome, as the detailed description of a place. The word comes from the Greek words τόπος (topos, place) and γραφία (graphia, writing). In classical literature this refers to writing about a place or places, what is now largely called 'local history'. In Britain and in Europe in general, the word topography is still sometimes used in its original sense, such as by The London Topographical Society. Detailed military surveys in Britain (beginning in the late eighteenth century) were called Ordnance Surveys, and this term was used into the twentieth century as generic for topographic surveys and maps. The earliest scientific surveys in France were called the Cassini maps after the family who produced them for four generations. The term "topographic surveys" appears to be American in origin. The earliest detailed surveys in the United States were made by the “Topographical Bureau of the Army,” formed during the War of 1812. After the work of national mapping was assumed by the U.S. Geological Survey in 1878, the term topographical remained as a general term for detailed surveys and mapping programs, and has been adopted by most other nations as standard. In the twentieth century, the term topography began to be more widely used to describe surface description in other fields where mapping in a broader sense is used, particularly in medical fields such as neurology. The objective of topography is to determine the position of any feature or more generally any point in terms of both a horizontal Coordinate system such as latitude and longitude, and elevation. Identifying (naming) features and recognizing typical landform patterns are also part of the field. Equally important is the accurate portrayal of multidimensional features, naturally occurring or human made, in two-dimensional form. Prior to the development of remote sensing techniques, unusual techniques were used. Wooden carvings were used by native peoples to depict coastlines and elevations; "stick charts" were created by Marshall Islanders to not only map distances, but also to note currents and wave fronts (Southworth and Southworth 1982). A topographic study may be made for a variety of reasons: military planning and geological exploration have been primary motivators to start survey programs, but detailed information about terrain and surface features is essential for the planning and construction of any major civil engineering, public works, or reclamation projects. Environmental research, travel, and sports are all beneficiaries of accurate representations of terrain and relief. There are a variety of approaches to studying topography. The most appropriate method to use depends on the scale and size of the area under study, its accessibility, and the quality of existing surveys. Surveying helps determine accurately the terrestrial or three-dimensional position of points and the distances and angles between them using surveying instruments. Even though remote sensing has greatly speeded up the process of gathering information, and has allowed greater accuracy control over long distances, the direct survey still provides the basic control points and framework for all topographic work, whether manual or Geographic Information Systems (GIS)- based. In areas where there has been an extensive direct survey and mapping program (most of Europe and the Continental US, for example), the compiled data forms the basis of basic digital elevation datasets such as United States Geological Survey Digital Elevation Model data. This data must often be edited to eliminate discrepancies between surveys, but still forms a valuable set of information for large-scale analysis. The original American topographic surveys (or the British "Ordnance" surveys) involved not only recording of relief, but identification of landmark features and vegetative land cover. Besides their role in photogrammetry, aerial and satellite imagery can be used to identify and delineate terrain features and more general land-cover features. These types of images increasingly have become part of geovisualization, whether as maps or GIS depictions. False-color and non-visible spectra imaging can also help determine the lie of the land by delineating vegetation and other land-use information more clearly. Images can be in visible colors and in other spectra. Photogrammetry is a measurement technique for which the coordinates of the points of a multi-dimensional object are determined by measurements made in two photographic images (or more) taken starting from different positions, usually from different passes of an aerial photography flight. In this technique, the common points are identified on each image. A line of sight (or ray) can be derived from the camera location to the point on the object. The intersection of these rays (triangulation) determines the relative three-dimensional position of the point. Known control points can be used to give these relative positions absolute values. More sophisticated algorithms can exploit other information on the scene already known. Satellite radar mapping is one of the major techniques of generating Digital Elevation Models. 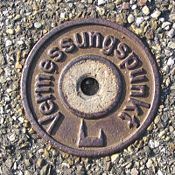 Seismographic information can be useful in mapping sub-surface structures. Similar techniques are applied in bathymetric surveys using sonar or depth soundings to determine the terrain of the ocean floor. Terrain is typically modeled using either vector (Triangulated Irregular Network or TIN) or gridded (Raster image) mathematical models. In most uses in environmental sciences, land surface is represented and modeled using gridded models. In civil engineering, for example, most representations of land surface employ some variant of TIN models. In geostatistics, land surface is commonly modeled as a combination of the two signals—the smooth (spatially correlated) and the rough (noise) signal. In practice, surveyors first sample heights in an area, then use these to produce a Digital Land Surface Model (also known as a digital elevation model). The DLSM can then be used to visualize terrain, drape remote sensing images, quantify ecological properties of a surface or extract land surface objects. Note that the contour data or any other sampled elevation datasets are not a DLSM. A DLSM implies that elevation is available continuously at each location in the study area, i.e. that the map represents a complete surface. Digital Land Surface Models should not be confused with Digital Surface Models, which can be surfaces of the canopy, buildings and similar objects. For example, in the case of surface models produces using the LIDAR technology, one can have several surfaces—starting from the top of the canopy to the actual solid earth. The difference between the two surface models can then be used to derive volumetric measures (height of trees etc). Topographic survey information is historically based upon the notes of surveyors who may have derived naming and cultural information from other local sources (for example, boundary delineation may be derived from local cadastral mapping). While of historical interest, these field notes inevitably include errors and contradictions that later stages in map production resolve. As with field notes, remote sensing data (aerial and satellite photography, for example), is raw and uninterpreted. It may contain gaps (due to cloud cover for example) or inconsistencies (due to the timing of specific image captures). Most modern topographic mapping includes a large component of remotely sensed data in its compilation process. A map of Europe using elevation modeling. In its contemporary definition, topographic mapping shows relief. In the United States, USGS topographic maps show relief using contour lines. 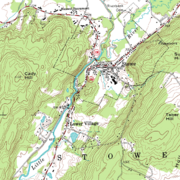 The USGS calls maps based on topographic surveys, but without contours, "planimetric maps." These planimetric maps show not only the contours, but also any significant streams or other bodies of water, forest cover, built-up areas or individual buildings (depending on scale), and other features and points of interest. While not officially "topographic" maps, the national surveys of other nations share many of the same features, and so they are often generally called "topographic maps." Existing topographic survey maps, because of their comprehensive and encyclopedic coverage, form the basis for much derived topographic work, thematic maps, for example. Digital Elevation Models, for example, have often been created not from new remote sensing data but from existing paper topographic maps. Many government and private publishers use the artwork (especially the contour lines) from existing topographic map sheets as the basis for their own specialized or updated topographic maps. Topographic mapping should not be confused with Geologic mapping. The latter is concerned with underlying structures and processes beneath the surface, rather than with identifiable surface features. 3D rendering of a DEM used for the topography of Mars. The digital elevation model (DEM) is a raster-based digital dataset of the topography (altimetry and/or bathymetry) of all or part of the Earth (or a telluric planet). The pixels of the dataset are each assigned an elevation value, and a header portion of the dataset defines the area of coverage, the units each pixel covers, and the units of elevation (and the zero-point). DEMs may be derived from existing paper maps and survey data, or they may be generated from new satellite or other remotely-sensed radar or sonar data. handle in a quantitative way the studied ground. Topography has been applied to different science fields. In neuroscience, the neuroimaging discipline uses techniques such as EEG topography for brain mapping. In ophthalmology, corneal topography is used as a technique for mapping the surface curvature of the cornea. ↑ Michigan Center for Geographic Information. What is topography? Retrieved March 17, 2008. ↑ Online Etymology Dictionary. Online Etymology Dictionary - topography Retrieved March 17, 2008. ↑ The London Topographical Society Retrieved March 17, 2008. ↑ Oxford English Dictionary "Ordnance Survey"
↑ See for example the publications of National Geographic Trails Illustrated Maps and Delorme products. Retrieved March 17, 2008. This page was last modified on 2 April 2008, at 17:54.